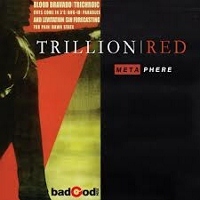 It doesn’t take long to know you’re in for an original ride once you hit play on Trillion Red’s latest, Metaphere. Odd-time drumming, joined tightly to a refreshingly audible and clangy bass guitar, carry along (jailbird-Burzum in tone, but modernly-written) dark ambient waves that punctuate angular guitar riffing that balances subtle sludginess and post-punk treble. I hear shades of Tiamat and Fields of the Nephilim here, but not without a power in the angrier moments/vocals that are reminiscent of introspective Neurosis passages. Even more captivating than those choices of colorful influences are the infusions of neo-folk, derived as they are from far less medieval techniques than most bands showcase. All of these disparate sounds coagulate to form Metal that deserves to be termed as ‘Avante-Garde’, as the press kit accurately states. Though not something of an ilk that comes across the Worm Gear inbox often, any music that truly challenges (while still having an aggressive edge) is always welcomed. Mastermind Patrick Brown, a San Franciscan solely responsible for the writing, performance and recording of Trillion Red’s latest, describes his sound as “heavy/crushing, yet calming/lulling”, and he is not wrong. Those particular dichotomies permeate each track, using whispered roars and fading piano under the ambient bits, helping to fluidly connect each song literally and figuratively. And appropriately so; this is not an album to pluck a track from and move on-it is meant to be played end-to-end. Metaphere won’t be understood in the proper context unless it is. Fortunately, enough depth and careful construction exists to merit multiple listens. Yet despite the pull one feels to run through the whole of the album again and again in the attempt to fully absorb its impact, one point of contention does exist, centering for me on the guitar sound itself. As noted, appealing riffs abound on Metaphere, but the instrument’s distortion feels thinner than I like, perhaps diminished somewhat by the thick layers of atmospherics that here and there threaten to overwhelm it. The choice serves the post-punk passages well, but gives some of the heavier guitar rhythms an almost-Adam Jones sheen, a tonality I never quite got the appeal of. After listening to Patrick’s early ’90s black metal band Nepenthe, I know wall-of-sound remains comfortably within his repertoire, and if I had my druthers we’d have more of that here. But since Metaphere exemplifies personal statement, perhaps more such trappings would have, for him, usurped his manifesto of “in darkness, in light or anywhere in between” approach. ~ by cliftonium on October 24, 2012. This entry was posted on October 24, 2012 at 5:40 pm and is filed under ALL REVIEWS, T-reviews.You can follow any responses to this entry through the RSS 2.0 feed.You can leave a response, or trackback from your own site.